Hello! Friday again and that means more new goodies over at Scrap n’ Dipity! 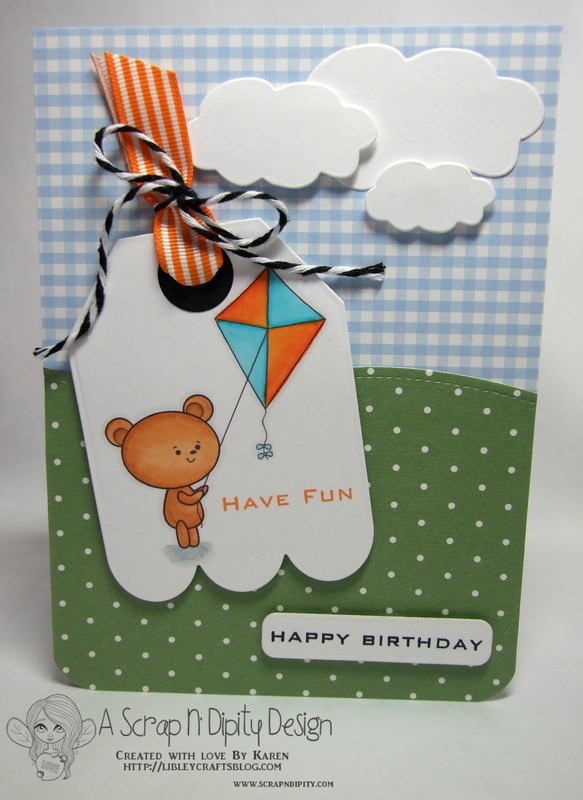 Alisha releases new digi stamps every Friday and this cute little fella is called L’il Bear Fly a Kite. Why not pop over to have a look round the store and see the other new images, and while you’re there visit the Challenge Blog to find the details of our February challenge. You have until the 14th of March to get your entry in and you could be in with a chance of winning a fab image! To make this card I also used papers by Papermania – ‘Boofles’, Spectrum Noirs, twine, ribbon and dies by Spellbinders, Reverse Confetti, Frantic Stamper, My Favourite Things. I also used a WRMK Corner Chomper and sentiment stamps by Waltzingmouse Stamps. Next > Scrap n’ Dipity – Beary Love….. So cute, Karen! Love how you created the scene with the papers. Awww…He’s so cute, Karen! I love that gingham sky and the puffy clouds! Awe! This is adorable! I love the tag element – it ties it all together perfectly! Awww…super cute bear image on the wonderful tag! Love the polka dots and gingham, too! Your choice of DPs is so clever, you’ve made a scene of nature by just adding two papers that resemble the sky and grassy ground. Super background for the image on the tag!